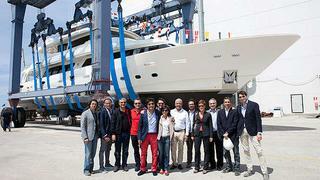 Two months after the delivery of the Navetta 33 Crescendo hull No. 12, Custom Line announces the launch of the hull No. 13 and 14 in this successful range. Based on the highly successful Navetta 30 and Navetta 33 series, the recent Crescendo version offers many improvements since her (re)launch in 2011. Designed by Advanced Yacht Technology and Studio Zuccon International Project, this 32.62m yacht is entirely customisable apart the structural details. Navetta 33C hull No. 13 will be delivered to Mexico. She has a contemporary interior, and based on special requests of the owner, her upper deck was modified to add a pantry between the pilothouse and the skylounge. Hull No. 14 of the Navetta 33C, also destined to the American market, has a modern interior featuring glass and white lacquered furnitures. Her upper deck was also customised with furnitures specially designed for the owner.